Longing tea or Dragon Well is a famous variety of green tea from Hangzhou, Zhejiang Province, China where it is produced mostly by hand and has been renowned for its high quality, earning the China Famous Tea title. The Longing tea is produced mainly in Mt.ShiFeng, MeiJiaWu, Mt.Wengjia, YunQi, HuPao, and LingYin. In the song Dynasty (960-1279), Zen master BianCai took the lead to plant tea in Mt.ShiFeng. He often held tea party with famous poets Su DongPo and Qin Guan. They enjoyed tea and chanted poems together, hence the entry of the name of the LongJing Tea into poems. Today, the LongJing Tea from Mt.ShiFeng is still regarded as the best. Zen master Bian Cai is also respectfully called the Forefather of the LongJing Tea. The LongJing Tea produced in Mt.Shifeng is known as S-LongJing. There are also L-Longjing, Y-LongJing, H-Longjing, and M-LongJing. L-LongJing is produced in Mt.Wengjia, Mt.Yangmei, Mt.Manjue, and Mt.BaiHe, which are called the Four Rock-shed Mountains by the locals. 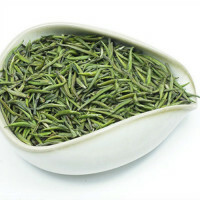 Y-Longjing is produced in YunQi, Mt.WuYun, and west of Mt.LangDang. 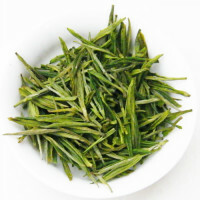 H-LongJing was produced in HuPao, SiYanjing, Chishanbu, and Mt.Santai. Later, the teas produced in FaYunNong, BaiLeQiao, YuQuan, JinShaGang, MaoJiaBu and HuangLongDong are also classified as H-LongJing. M-LongJing is produced in the area around MeiJiaWu. Picking of LongJing Tea focus on three elements,namely Early-Picking, Picking of Tender Leaves, and Thorough Picking. The tea picked before the QingMing Festival, or Pure-Brightness, one of the 24 solar term in Chinese lunar calendar, has the best quality and is called Pre-PB tea.Grain Rain, another solar term, has a good quality and is called Pre-GR tea. Picking of Tender Leaves refers to the picking of the tender and complete tea buds and leaves, usually one bud with one leaf or one bud with two fresh leaves.Thorough Picking refers to the quantity of the picked tea leaves. Each kilogram of dry tea contains 70,000 to 80,000 fresh tender tea buds and leaves. The LongJing Tea has been known for its green leaves, rich aroma, sweet taste, and beautiful shape. Normally, the quality of the LongJing Tea is judged one 5 aspects, namely appearance, aroma, taste, soup color, and brewed leaves. The best-quality tea has a flat and smooth appearance, tapering leaves, an even and neat contour, and a fresh green color. 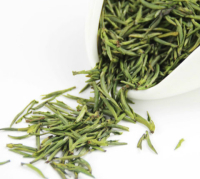 The good-quality LongJing Tea has a pure and fresh aroma that lasts long. Its taste is in direct proportion to its aroma.The tea leaves with good aroma usually have good taste. The fresh sweet taste is the best. Tea soup is judged on its tone, brightness, and clearness. The clear and bright tea soup is the best. The high-quality LongJing Tea has tender, complete, green, and bright brewed leaves that are in even sizes. An Ji Bai Cha, or An Ji White Tea (in English) ;Anji refers to the place where she is grown: Anji county of Zhejiang province. It contains at least 6-8% of amino acids, of which at least 2.5% is theanine, roughly 3-4 times the levels found in other Chinese green teas.Theanine is the single most important determinant of tea quality. It is chiefly responsible for the soothing effects and full-bodied taste of fresh green tea. A special characteristic of Anji tea plants is that they produce very little green chlorophyll during the winter (minus 8 to 10 degree Celsius). Two things result:Since less theanine is converted to chlorophyll, the tea buds contain higher levels of health enhancing theanine.The tea buds are white in color.After processing, the tea leaves acquire a pale yellowish-green color. Long Ding Tea is produced in Kaihua County,Zhejiang province which is the source of Qianjiang river. The Buddha Tea from Mt.Putuo is a semi-baked and semi-stir-fixation green tea. It is picked once a year in spring after the pure-birghtness. Its fresh leaves are the first bud and the first two leaves. 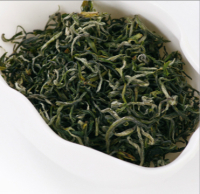 The Buddha Tea has tightly curled leaves with a green, moist, and tippy appearance. The tea soup is bright yellowish green with pleasant sweet aroma. It tastes fresh and pure. The brewed tea leaves are soft and bright and cluster into lumps. Mt.Putuo is located to the southest of the ZhouShan Archipelago of Zhoushan City,ZheJiang Province. It is ine of the four Buddha holy lands in China and the well-known site for mother buddha. Mt.Putuo has many manmade landscapes, including several hundreds temples, monasteries, and thatched huts. Among the most famous are the Puji temple, Fayu Temples, Huiji Temple. Huiming Tea, or “White Tea” in ancient China, is a traditional famous tea in Zhejiang Province, which is also called Jingning Huiming. It is produced in Jingshan which sits in Yuhang County,Zhejiang Provience. Jingshan mountain is now located on the north foot of Tianmu Mountain on the border of Yuhang and Lin'an counties, Tea area is a tropical monsoon climate, mild and humid, rainfall, average annual temperature is 16 ℃, and annual precipitation is 1837 mm, 1970 hours of sunshine, frost-free period 244 days, is very suitable for tea growing. Jingshan tea has strict picking standards, as a bud and two leaves, about 3 cm in length, neat uniform. Jingshan tea is very tender; per kg dry tea has 62,000 fresh shoots. Production processes of Jingshan tea include: fixing, rolling, re-rolling, spreading, drying and other processes. a traditional famous tea in Zhejiang Province, which is also called Jingning Huiming. also known as Jing Shan Mao Feng, has a long and close relationship with Buddhism.it is a famous green tea. Tianmu Qing Ding tea produced in Tianmu Mountain of Lin’an County, Zhejiang. Tian Mu Shan (Mountain) is due west of Hangzhou, near the edge of Zhejiang province. Tianmu Qing Ding tea picks a bud and a leaf or a bud and two leaves. Tianmu Qing Ding tea include production processes: fixing, drying, spreading, re-bake, bake five processes. This organic Tian Mu Qind Ding green tea has tip and straight shape, covered by pekoe on the whole surface, presents deep green color. 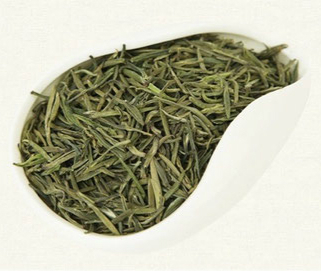 With the unique clean aroma of green tea, the Organic Tian Mu Qing Ding Green Tea tastes fresh and mellow when brewed. The soup looks bright green and the buds and leaves are clear. It is a premium organic tea with good shape, nice aroma and fragrant flavor. Silver Monkey tea is grown in the ancient city Songyang Ou River upstream area,a unique ecological environment for the formation of silver monkey tea quality to provide a congenital condition. one kilogram of premium silver monkey frying tea, to be taken about 70,000 shoots. Collected debris back shoots should be removed to keep shoots complete uniform. Fresh leaves into the plant by 6-7 hours after the fresh leaves spreading, before frying. Separately frying process is mainly green, rolling, two blue, three green, drying and other five processes. Frying characteristics: high-temperature fixing, rub fried combination of slow light fried, while the whole side of fried, baked feet dry. Song Yang Yin Hou Tea (Silver Monkey Paw Tea) is a green tea original from Song Yang county in ZheJiang province.Silver Monkey Paw tea is curly, more tips, like monkey claw, hence the named. Qian Dao (1000 Islands) a world famous resort, known for its beautiful scene and far from pollution. Qiandao Lake in Chun'an town, which is encircled by 1000 high mountains. Qiandao Lake is an ideal place for planting organic, green,pollution-free tea,for the climate there is mild and humid,cool in summer and warm in winter. It is considered as the "hinterland" and "Golden Triangle" region of china tea. 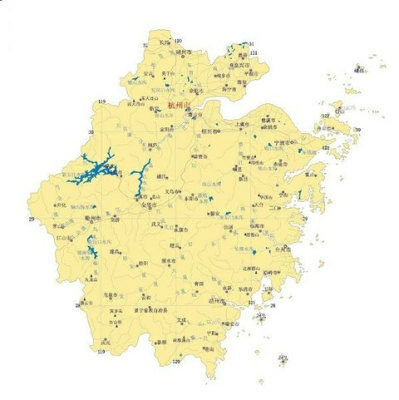 The tea history of 1000 Island Lake begins 1000 years ago, in East Han period. And to the Tang Dynasty, tea produced in this place was presented only the the emperor, which honored the name of “gong cha”. There’s a very interesting story in how tea there becomes “gong cha”. Yuye Tea (Jade Leaf Tea), as its name goes, meaning every leave is green as jade and precious as Jade. This tea is nominated esp. for its fragrance. Unlike other green tea, the smell of Jade Leave is fresh like newly-sprung bud in early spring. 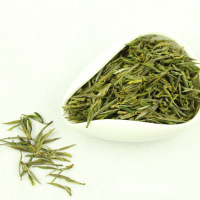 Yinzhen Tea (Silver Needle Tea) got its name from the silver-like appearance. When drink, put 3g in a glass cup, fill it with boiling water, then you can enjoy a splendid scene of all the bud standing in the cup. It is produced in in the hometown of Chinese organic tea-Wuyi, Zhejiang Province. WuYang ChunYu green tea's picking time is in Feb of every year, which is ealier than the other green tea's picking time. the tea farms is in the high mountains in Wuyi county,tea growth is environed with fresh air, cloud and mist all year round. As the curiosa in various teas, Its color is green and bright and perfume and taste are pure and mellow. Fresh leaves of Green Sword tea collected from the sword-leaved variation tea tree. Green Sword tea has strict picking standards, as a bud and two leaves, about 3 cm in length, neat uniform, usually pick in late March. Production processes of Green Sword tea include: fixing, rolling, re-rolling, spreading, drying and other processes. the meaning of its name is "Wu Yang Spring Rain",The one night spring thunder falls ten thousand silk "(Chinese ancient poem). 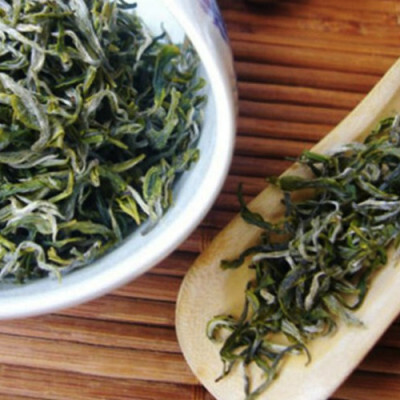 also called Green Sword tea , is grown in the Longmen Mountain and Dongbai Mountain of Zhuji City, Zhejiang. Tea regions have dense forests, climate temperature and humidity, fertile soil, very suitable for tea growing. Guzhu Zisun tea also called Huzhou Zisun, Changxing Zisun. Guzhu Zisun tea produced in Guzhu village of Changxing County,China’s Zhejiang Province, famous as early as 1200 years ago. It was picked entirely by hand using the standard of primarily two tiny leaves and one bud, and the processing was also carefully done by hand to preserve the integrity of these beautiful little leaf sets. As with most Chinese green tea, this tea was picked, withered in the sun and/or indoors, heated in a low temperature wok to kill the enzymes in the leaves that would otherwise cause them to oxidize and turn brown, and finally dried before packing and shipping. Wanghai tea is specially made of the tender raw tea growing at the summit of Tiantai Mountain in Nanxi, Ninghai County, in Eastern China'sNingbo City. The appearance is beautiful and tender, glossy and green. The smell is sweet and runs long, with a delicious and sweet taste. With the infused tea having a clear and green color, the infused leaves are light green and bright. The tea gives a sweet and luscious aftertaste that lingers. The tea shows a jade-green color in the cup with a soothing aroma.Rich in anti-oxidants. The name Zi Sun means "Purple Bamboo Shoot", so called because the unprocessed tea leaf is partially purple in color and its slim, narrow shape resembles that of a bamboo shoot. made a name of Provincial Tea for itself in 1984.